Ok, these were simply incredible. My parents threw a huge 60+ person BBQ over the weekend and I was designated to do all the desserts. Obviously. One of the several desserts I made were these cherry cheesecake squares. Picture this: chocolate chip cookie crust, cherry cheesecake filling, almond streusel topping. Um, amazing. Unfortunately I wasn't able to take any more pictures of the actual squares because these were gobbled up in about 5.2 seconds; no joke. However, I would HIGHLY advise you to make these and you can interchange any kind of fruit filling; i.e. apple, blueberry, etc. You can even go with a sugar cookie crust if that suits your fancy! The best part about these bars is that the cookie crust comes from a mix. I rarely ever bake anything from a mix but I had so many desserts to make that I thought it would be easier on myself to cheat a bit..Enjoy! Im sure these were gobbled in a few seconds :) they re delicious! These are right up my alley- bookmarked! These look absolutely fabulous. I could go for one right now with my coffee. Love your blog.. first time here. Nice to meet you. 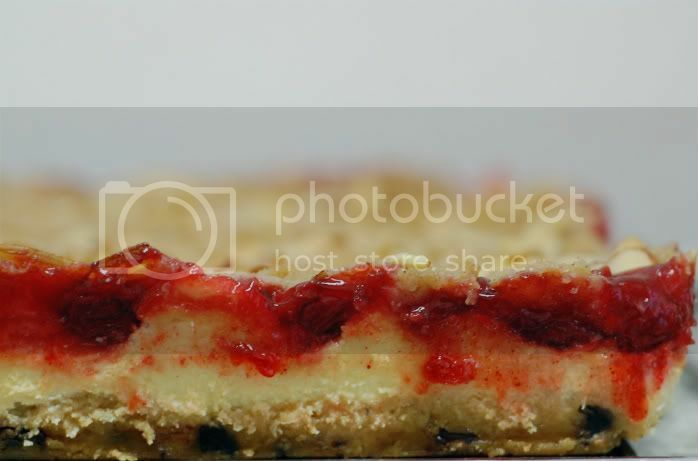 Just found your site and I love it... can't wait to try those cherry cheesecake squares... yum. Looking forward to more deliciousness. Thanks for the inspiration. Oh, and good luck in culinary school. Wow.